DAUGHTERS OF PENELOPE: Will hold a monthly potluck luncheon meeting on Thursday, December 3 at 6:30 pm upstairs. All interested ladies are welcome. Please contact Evonne Dabkovich to RSVP (805-218-5693 or 805-987-3504) and let her know what type dish you will bring. Daughters of Penelope will be holding a Sees Holiday candy sale from November 15 through December 25. 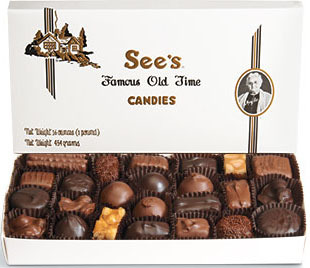 Sees boxed candy, novelties, and gift certificates will be available to take, or for preorder. Proceeds help to fund national projects such as The Penelope House, domestic violence family center and the Saint Nicholas National Shrine at the World Trade Center plus local charities such as providing Christmas gifts to a needy family through the Rain project. Ending The Silence: is a 50 minute program designed for jr. high & high school audiences. This transformational program is devoted to giving students an opportunity to learn about mental illness through an informative PowerPoint, short videos, and personal testimony. Through the presentation, students learn symptoms and indicators of mental illness, and are given ideas about how to help themselves, friends, or family members who may be in need of support. St. Demetrios will host a meeting here on Tuesday, December 15 at 7pm upstairs in the Assembly Hall. Call the church office 805-482-1273 for more details. Our very own Dean Valle is working on an Eagle Scout project and beautifying St. Demetrios is his project! To accomplish this worthy goal he's asking for help. Meet behind the Cross to pull weeds and dead plants, plant new plants and trim overgrown weeds. Donations for new plants greatly appreciated. Trim overgrown plants, spread bark and replace dead plants plus add some new ones. Any money donated for the purchase of plants would be greatly appreciated. He'll take the money at any time between now and during the weekend---he's collected about $400 bucks or so; but his budget is about $1000. Your muscles (physical and financially) are very much appreciated!!! If you enjoyed the pastries at our festival, here is your opportunity to pre-order some for Holiday entertaining, to give as gifts, or just for your own enjoyment. Try our spanakopita rolls and tamales as well. Proceeds from our fundraiser support Ventura County Charities.